Here’s a press release I received from Zyrus on a new book coming out in July. (Irvine, CA) - As the use of the Internet and electronic visual media becomes more of a vital part of the coin industry, photographing coins, either raw or slabbed, has become an increasing concern with collectors and dealers. How do I get a good detailed image of this coin? What are the tools I need? Do I need to purchase any expensive equipment? What kind of lighting should I use? What techniques can I use to produce a good image of this coin? 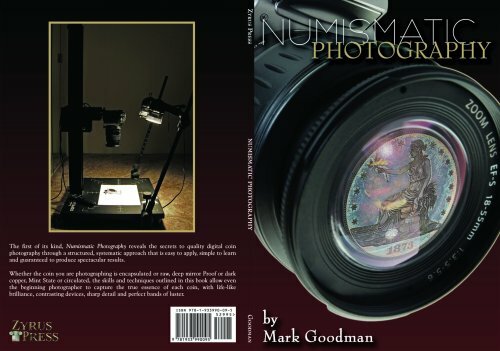 In Numismatic Photography (published by Zyrus Press), Mark Goodman teaches the reader in an easy-to-read and visually rich guidebook format on how to image quality photos of coins with your digital camera. Whether you are using a digital camera for the first time or you already have experience in other fields of photography, Goodman addresses typical problems faced by the photographer, recommends ways of improvements and offers specific tips and techniques for raw and slabbed coins. Some of the chapters included are Imaging Concepts, Color and Luster, High Contrast Coins, Low Contrast Coins, Toned Coins, Special Imaging Techniques and Image Presentation, among others. The book also includes two appendices: a Troubleshooting Guide and General Rules for Coin Photography. Releasing on July 15th, look for copies of Numismatic Photography in bookstores nationwide, your local coin shop, or Amazon.com. You can also order from Zyrus Press by mailing to PO Box 17810, Irvine, California 92623, calling (888) 622-7823, or online at Zyrus Press.